The handheld vacuum cleaner is a great choice smaller jobs including quick pickups of dirt or spilled food. These little mini-vacs as they are sometimes called are compact, lightweight, and easy to use making them an ideal solution to a very typical problem. The majority of them are cordless so you can easily move around the home or take them outside for a quick cleanup of the car or minivan. With this type of versatility, it’s easy to see why they are so popular. Cordless Design – While you can find some corded models that work well, it really takes away from the convenience advantage so any hand vac on our list will be of the non-corded variety. Constant Suction Power – You certainly don’t need maximum power but you do want a constant suction that does not fade while the battery is draining. Today’s batteries are technologically designed to keep power up until they are drained. Battery Life – Since we recommend going cordless when choosing, it makes sense to find one with a battery that will last long enough to clean up everything you need to. Lower Weight – A handheld vacuum will be carried around quite a bit so you need to find a light machine. Fortunately, the majority built today are constructed using lightweight material. Tank Capacity – When all things are equal between two different vacuums then take the one with the higher capacity dirt collection chamber. You will be emptying it less often, resulting in time savings each time you use it. 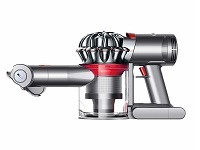 The Dyson V7 Trigger has the power of their larger vacuum cleaners but in a compact and portable frame. It is lightweight at just 3.5 pounds and has a unique ergonomic design so you can use it for longer without tiring. The handle and trigger are easy to hold, even when bending and reaching down into tight spots. Dyson claims the V7 has the strongest suction power of any handheld vacuum on the market and they are likely correct. While we haven’t tested every single model from all brands we can say that it has tremendous suction…a surprising amount actually. The lithium ion battery spins the digital motor at a maximum of 107,000 RPMs. There are no other handheld brands that can boast that with their vacuums, cordless or corded. There is more technology inside that also help push the air through with such force. Their 15 internal cyclones have a patented 2 tier Radial™ design to generate more G-forces than any of their prior offerings. They work together to drive the air into the post motor filter, which is specially designed to trap virtually all small dust particles. The air moves so fast that it actually separates the dirt from the air to keep the filter from clogging. It’s the same technology used in their larger upright and canister cleaners. Other features include a mini motorized tool for removing stubborn pet hair, a combination tool for dust, and a crevice tool for tight corners. The battery also provides 30 minutes of fade-free power which is more than enough for the types of messes the V7 will be picking up. What stands out most on the Dyson V7 cordless? Extreme suction power is higher than any other handheld you will find. This may or may not be needed but it’s always nice to have. The light overall weight and ergonomic design make it easy to hold. Some vacuums can cause wrist pain during use but the V7 has been designed to avoid that. One button emptying of the dust chamber keeps the dust particles away from your skin. Build quality is high which is what you expect from a Dyson. The V7 will last you for many years. And what things don’t we like? MAX mode kills the battery quickly, usually in 5 minutes or so. Sbould have removable batteries so you can always have one charging. Where can you find today’s lowest pricing? Click here to visit our recommended supplier to compare the Dyson V7 to other hand vacuums and read reviews from other consumers. The Shark ION W1 is an innovative and easy to use hand vacuum from another major player in the home cleaning industry. It has an ultra compact design with a slim body that can fit into any tight space. With a light overall weight of 1.4 pounds your wrist will not get tired holding it. The W1 is one of the lightest and easiest to use handheld vacuums you will find today. Even though the overall size is small, the suction power is more than you would expect. Shark has never been a company to produce a vacuum with low power so they certainly weren’t going to start with the lithium ion powered W1. Like the other major players in this category it is powered by a lithium ion battery that spins their newly designed brushless motor. There is little resistance inside which allows the motor to focus on moving the air through, resulting in a high rate of speed. The main features include a multi surface pet tool for pulling up stubborn animal hair, a long crevice tool, easy fingertip controls, and one touch debris emptying. Simply open the garbage up and push a button on the W1. All the collected dirt drops down without any contact to your skin. The ION charging dock also lets you sit the vacuum in it to charge while not in use. It is small enough to fit on your kitchen counter to make sure it is close at hand when needed. What are the positives on the Shark ION W1? Very compact and lightweight, making it the easiest to use hand vac you can buy today. For smaller messes and quick pick-ups it is one of the best choices. Docking station works great and is easy to tuck out of the way in your kitchen or living room. Pet tool is surprisingly effective at pulling up hair and dander from your furniture or bedding. The price is lower than some of the larger models in the handheld industry. What things could use improvement? It can take a while to get used to the location of the on/off button. Sometimes you will accidentally hit it during use. Collection bin is small but that is due to the slim design. If you have large messes you will need to empty multiple times. Where can you price the cordless Shark out and read more about it? Click here to visit our favorite eCommerce site for more information including shipping options and availability. The Oreck Ultimate is a very capable bagged handheld vacuum from one of the best known companies in the residential and professional cleaning industries. It is quite a bit different from the ION W1 mentioned above. The biggest difference is it is NOT cordless, but instead comes with a 20 foot electric cord. While you lose the advantage of being 100% portable you do get the added plus of never losing suction power due to a drained battery. The filtration on the Ultimate is excellent as it comes with a HEPA filter. This is not something you find on all handheld vacuums, usually only those who are built for more than just quick pick-ups. The filter is rated to trap more than 99% of those tiny allergens like dust mites, pet dander, and mold spores. The air that comes out is much cleaner than the air that goes in. With your purchase of the Oreck Ultimate you get a telescoping extension wand, a dusting brush, an upholstery tool, and a crevice tool for those tight spaces. You also get a large floor attachment that can work on hard floors like tile, laminate, hardwoods, and linoleum. This is much different than other handheld vacuums that are mainly for ‘above the floor’ cleaning. What are the pros on the Ultimate? 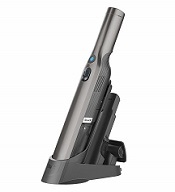 The cleaning ability is excellent and much more than you would expect from a handheld. This little Oreck is more like a small canister vacuum cleaner than a hand vac. HEPA filtration is excellent and helps remove harmful allergens from the air. The quality of construction is very high which is what you would expect from an Oreck. It is fairly quiet during operation which cannot be said about most of the competition. And a couple of the cons? It is corded so you must operate within a general location of an electric outlet. This makes it more difficult to use on your car or in your garage. You have to buy replacement bags so there is an ongoing expense to owning it. Where can you find out more about the Oreck to see if it makes sense for your home? Click here to visit our favorite eCommerce site for more information including pricing and more. 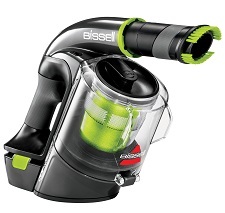 The Bissell Multi is a unique looking cordless handheld vacuum that comes with a list of user friendly features. It has a long lasting lithium ion battery that is removable for easier charging. And another advantage is you can always charge one of the batteries while vacuuming with the other. Not sure why all brands don’t do this…thinking of you Dyson. The first thing you will notice from looking at the Multi is the way the cleaning port comes out of the top. This design along with the position of the handle make it a very ergonomic model that is easy to use in all positions. Whether you are cleaning tight spaces or using it with the extension wand, you will find this to be very easy to hold on to. Not only do you get an extension wand but there is also a built in extension hose that slides right out as needed. This feature combined with the various attachments make it one of the most versatile handheld vacuums you will find today. And speaking of attachments Bissell includes a motorized brush roll, a crevice tool, and a dusting brush which is pretty standard. You also get “one touch” emptying which is important to keep dust away from your skin, especially if you have any indoor allergies. What things do we like most? The ergonomic design is unique and quite functional. It’s easy to use in a variety of positions which is important for a hand vacuum. Removable batteries are a great feature to have. You can keep one charging while you are using the other if you desire. Built-in extension hose works great and is similar to what you would find on a larger cleaner. Dual LED lights really light up the area around the Multi so you can see what needs to be picked up. What things are we not crazy about? Suction power is good but not great when compared to some of the other vacuums in this category. The runtime is somewhere around 30 minutes or slightly lower depending on the amount of charge in the battery. Would be nice to get more time but an extra battery can cure that. So where can you learn more about it and check current prices? For more information including consumer reviews, click here to visit our recommended online supplier. The Rocket handheld is another quality offering from Shark with the capability to clean a variety of surfaces around your home. It’s another corded model like the Oreck listed above, but it’s lighter and more portable. It doesn’t come with the latest generation of lithium ion batteries since it is corded but it does have some features that make it a great choice depending on your needs. They claim it never loses suction (hence the Rocket name) and they are largely correct. When the washable filters are cleaned and maintained on a regular basis it maintains a large amount of suction power as compared to its’ peers. 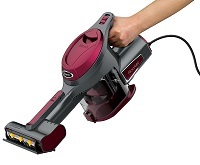 Shark is known for powerful vacuum cleaners, especially their Rocket lineup so it isn’t surprising that this handheld model is so robust. It is definitely designed to pick up just about anything you throw at it without bogging down. The TruePet™ motorized tool works great on pet hair that sticks to furniture fabric. The spinning brushes agitate the hair so the powerful suction can do its’ job and pull it up. You also get a stretch hose, crevice tool, and dusting brush for the other applications you will undoubtedly encounter. The Shark Rocket works great on stairs, furniture, bedding, and cars as long as you are near an outlet. What are the best qualities of the Rocket? The suction power is very good so you won’t bog down with larger dirt particles like some of the lower quality models. The hose is a nice addition and lets you reach things that would be more difficult without it. It is very lightweight at around 4 lbs. so you can use it for extended cleaning sessions without tiring. Very solid construction so there is little doubt it will last for a long time. And what about some of the things that need improvement? 15 foot power cord is pretty short by today’s standards. No storage hook included so you just have to put it somewhere out of the way when not in use. If you are ready to price it out, click here to visit our most recommended website for purchasing. You can read consumer reviews and compare it to other similar hand vacs before buying.